Description: This listing is for ONE set of grips. Buyers, however, may take any number of extras that we have on hand at the same per-set price and with no additional shipping charges. 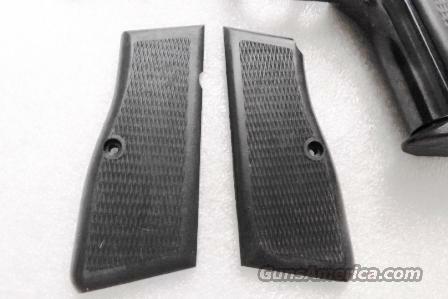 Photos show specimens of replacement grips to fit the FEG clones of the venerable Browning Hi-Power Pistol. Manufacturer was Fegyver És Gépgyár, known as Femaru and later simply FEG, of Budapest, Hungary. Importer was KBI of Harrisburg PA, previously dba Kassnar Imports. They will fit Hungarian made copies of the Browning Hi-Power model of 1935, the single action variants. With patience and tweaking to the screw hole, we have installed many of these on FN Browning Hi-Powers themselves. The right grip screw is placed slightly different on the Hungarian clones, and we had to carefully recess the screw cavity on the right panel to make them fit. All these grips are new unissued old stock, all of them are 1990s production and surplus from the liquidation of KBI around the turn of the millennium. They have been stored in bulk for years, and have minor scouring marks on the edges occasionally, but that will easily polish out. Note that these Do Not include grip screws. We’re offering the grips in the photos or their identical mates from the same lot each	for only $ 14.00.